If chronic pain – escalations in pain medication should be made with discussion with outpatient providers. If acute pain – determine nociceptive or neuropathic pain. Discuss expectations up front including function related goals over absence of pain. NSAIDs +/- Acetaminophen are 1st line meds for most acute nociceptive pain and are just as effective as opioids. Scheduling NSAIDs and acetaminophen provides continuous pain control that avoids many of the challenges of PRN medications. Nonpharmacologic treatments in the hospital include mobility with PT and heat/cold packs. In general, NSAIDs are not absolutely contraindicated in patients with chronic kidney disease, hepatobiliary/gastrointestinal disease, and cardiovascular disease. Using NSAIDs at low doses and for short duration helps mitigate risks for kidney, cardiovascular, and GI disease. Low risk for GI toxicity = no risk factors. Moderate risk = 1-2 risk factors. High risk >2 or h/o previously complicated ulcer. Consider a PPI while on NSAID therapy for moderate and high risk patients. Due to risks of impairing prostaglandin-mediated renal perfusion, NSAIDs should be avoided in decompensated cirrhosis. Bleeding risk is also significant in this population. Starts with a discussion of treatment goals and duration up front. Use low dose, oral, short-acting opioids for the shortest duration possible. Combining opioids with non-opioid adjuvants like Acetaminophen and NSAIDs creates an opioid-sparing and synergistic effect. Helps improve pain control at lower opioid doses. Lower doses and shorter courses of opioids expose the patient to less risk of opioid-related adverse effects. When prescribing opioids on discharge physicians should consider risk of chronic opioid use in addition to other adverse effects like sedation and constipation. Best practices include communication of opioid analgesia plans and expectations with the primary care provider. Both Acetaminophen and NSAIDS inhibit COX enzyme from making prostaglandins which accounts for their antipyretic effects. NSAIDs acts peripherally to block COX and reduce inflammation = good anti-inflammatory effects. Acetaminophen acts more centrally which explains absence of significant anti-inflammatory effect. The risk of masking fever when scheduling acetaminophen and NSAIDs is low when the source of infection is known and other markers are available for monitoring. M: This is Dr. Marty Fried, Dr. Shreya Trivedi and Dr. Alexis Vien. This is the CORE IM 5 pearls podcast bringing you high-yield evidence-based pearls. Today we’re discussing pain control in the hospital. SHANI HERZIG: about a quarter of patients who are opioid naive prior to hospitalization end up receiving opioids after discharge or on discharge by virtue of filling an opioid script in the week following discharge. And then of those, almost half of them are still using opioids more than 90 days later. M: Oh snap – who was that? S: Yes, that was one of our outstanding peer-reviewers Dr. Shani Herzig. She is the Director of Hospital Medicine Research at Beth Israel Deaconess Medical Center and Assistant Professor of Medicine at Harvard Medical School as well as a practicing hospitalist. SHANI HERZIG: All of this taken together leads me to believe that hospitalization has been under recognized as a site that really matters in the overall trajectory of opioid use for patients in our country. M: OK. If I wasn’t listening before I certainly am now – and we are super excited to be joined today by Dr. Alexis Vien, a hospitalist at Weill Cornell and brand new friend of the pod! Alexis so great to have you on! A: Really great to be here! S: Thanks for working on this episode! M: We are also very grateful to Dr. Hiremath – University of Ottowa neprhologist and Neph-J-C famous, who was also very helpful in researching for this episode. SWAPNIL HIREMATH: I tell my patients when I give them a prescription – your pharmacist is going to tell you this is wrong, but say that your kidney doctor knows what he is doing! M: Haha – man that was a fun interview. We will hear from both Dr. Herzig and Dr. Hiremath more later in the episode. So Alexis – you approached us with the idea for this episode, can you tell us more about what prompted the idea? A: I heard Dr. Herzig speak about safe opioid prescribing at Society of Hospital Medicine last year. It was really helpful as one of my main interests is what it means to best treat pain in light of the current opioid epidemic. S: Umm, I’m not sure about that Marty. Goals for this episode are to be as practical and realistic about the pain points as possible. And we have good stuff! Alexis can you start us off with a case? A: Sure we have a 65-year-old woman with osteoporosis and CKD III who presents to the ER after falling at home. After the fall she has severe 7/10 left sided non-radiating hip pain worse with bearing weight which is what prompts her to go to the ER. She is found to have pneumonia and a nondisplaced pelvic fracture. Orthopedics is consulted and recommends non-operative management of the fracture. M: Sheesh – broken hip sounds tough, we’re being really tough on imaginary patients here guy. So Alexis, where do we start here – are we thinking PCA and calling it day? A: An important initial step in inpatient pain management is clarifying whether this is an acute pain episode or an acute flare of chronic pain. The reason is that any escalation of a chronic pain regimen should really be coordinated with the outpatient provider. Also, chronic pain differs in terms of pathophysiology and treatment so that’s a topic for another day. S: Okay well in this hip fracture case it looks like a clear case of new acute pain and NOT a flare of chronic hip pain. A: Agreed. Next step is then classifying the pain as nociceptive or neuropathic. Nociceptive pain includes things like musculoskeletal, inflammatory, procedure-related pain as opposed to neuropathic pain that includes things like post-herpetic neuralgia or neuropathies. M: I think the barrier here is to not stop at patient has pain but asking those few extra questions: What is the quality of the pain? Where does it radiate? That will help you characterize and classify it. SHANI HERZIG: So for pain that is inflammatory in nature, musculoskeletal in nature, I’m going to be reaching for things like nonsteroidal anti inflammatory drugs and Acetaminophen as kind of the mainstays of therapy while for pain that has a neuropathic component exemplified by things like burning or tingling. I may start reaching for things, Gabapentin or Pregabalin. S: Great so for this MSK pain, let’s go deeper into NSAIDs and acetaminophen: what’s effective dosing? A: An example of a regimen I would use for this patient would be scheduled Ketorlac 15mg q6h and Tylenol 1g q8hr or naproxen 500mgq12 again with that scheduled tylenol every 8 hours. Keeping in mind that when using NSAIDs there is a ceiling effect in terms of pain relief. S: So you dont have to reach for that 30mg of ketoralac! 15mg is just fine. Check the script and shownotes on coreimpodcast.com if you want to learn more about the ceiling effect of NSAIDs! M: The point here is that this gives us more continuous pain control instead of waiting for the pain to get severe and then the patient asking for pain meds. And I’ve seen some people overlook the contribution of nonpharm treatments like mobility with PT, heat packs. S: Superficial heat for the win! I do appreciate you emphasizing scheduled medication here. Bc then we can add PRN breakthrough medications if needed – we’ll get to that in a later pearl. M: I’m lucky enough to have only spent overnight in the hospital on two occasions – the birth of my daughters – and I just remember how difficult it was to get p-r-n meds for my post-partum wife. And not because our nurses weren’t amazing it’s just a constant juggling act for our inpatient nursing colleagues. So yeah – let’s order these around the clock instead of just PRN! A: I can remember so often my team has put in PRN meds that we never even told the patient about so they never knew to ask for it. SHANI HERZIG: One of the big myths that I want to demystify is that the myth is that opioids are the most effective medications for severe pain. And that’s simply not true. There are a number of different cochrane reviews on topics ranging from postsurgical pain to acute low back pain to even nephrolithiasis kidney stones. The most, the most painful thing supposedly that we see. All of these cochrane reviews show at least as great efficacy for NSAIDs compared to opioids in each of these conditions with lower risk for side effects and other adverse effects. So I really think we need to dispel the myth that opioids are the most effective medications for severe pain. A: Yeah I couldn’t agree more. I’ve seen this in practice where patients with low back pain had a better response to NSAID and acetaminophen combination than to oxycodone. M: We will link a few sentinel articles in our shownotes for those who want to dive into the efficacy literature a bit more. SHANI HERZIG: there’s a movement away from using pain scales and towards talking about the impairment and function resulting from the pain interference with sleep for, so kind of the implications of the pain for the patients every day life and sleep as opposed to where is your pain on a scale from zero to 10. And I would strongly argue that our goal is to achieve tolerability of pain rather than its complete absence. We need to find the right balance of benefits and risks ultimately. And when we’re reaching a situation where we’re achieving complete absence of pain, we are almost always overshooting this balance in placing a patient at higher risk. And so I discussed with patients that my goal is to make the pain tolerable enough to you that you can get up and engage in your daily activities and be able to get a decent night’s rest. M: That explicit discussion of expectations here with our patients makes a big difference. I certainly know I can do a better job in the beginning of the hospitalization discussing about what the next few days are going to look like – how often they are going to see me, who is their contact person, and what are realistic goals for the major hospital problems. S: I have definitely learned the hard way that bit of time on day 1 can make tough conversations on days 2 and 3 a bit easier. A: So to summarize this pearl – the main takeaways are that non-opioids can and should be the foundation of pain control in our hospitalized patients. Their efficacy is underappreciated, and we should be writing for them standing instead of ‘as needed’. Finally, messaging is crucial. Set expectations around goals of pain control, focusing more on functional outcomes than a number. S: Ok I’m all on board with using more non-opioid analgesics in the hospital. BUT, our patient has a history of CKD stage III, and I can already hearrrrr the pushback from my residents about using NSAIDs in patients with kidney disease. SHANI HERZIG: The one thing that I have noticed is that I think it’s crazy how underutilized NSAIDs are, and I think that it stems from both an underestimation of their efficacy and an overestimation of their risks. And you can contrast that with opioids where where, I think, we’ve had an overestimation of their efficacy and an underestimation of their risk. S: Yeah wow – i had to replay that twice bc it sounded so good and paradox is true. If we think about it, the risks of renal complications in NSAIDs is taught very early on and reinforced throughout training. But what we forget when opt for opioids over NSAIDs is that we are making a risk-benefit choice. M: And Dr. Herzig did a nice job in our opening clip explaining that a major risk of inpatient opioid use is ongoing outpatient opioid use. This is in addition to the known risks of respiratory depression, sedation, constipation. So let’s spend a little bit of time on the risks of NSAIDs – quick question do you guys remember how NSAIDs cause AKI? M: Yeah no worries I totally forgot this med school nugget as well until we spoke to Dr. Hiremath. SWAPNIL HIREMATH: They are just like ACE inhibitors at a different level – ACE inhibitors act on the efferent and prostaglandins act on the afferent, and NSAIDs block that. So if you are volume contracted, the ACE inhibitor is not going to be good. Similarly if you are on heavy NSAID dose and you become volume contracted, low and behold you are going to get AKI. Those effects are genuine, I believe them. And that is the risk you are taking when you are prescribing these drugs, but that doesn’t stop us from using ACE inhibitors, so why should that stop us from using NSAIDs – especially short-term NSAIDs. S: Woah, its powerful when we put NSAIDS and ACEs side by side. I lost track of the fact that the mechanism of AKI in NSAIDs and ACEs are similar. Think of all the heart failure patients with tenuous volume status that we have on ACE inhibitors and we don’t necessarily worry about long-term renal complications. A: Yeah. We should point out that Dr Hiremath was very transparent that his opinion probably doesn’t represent the majority of nephrologists – but he argued that we are probably overly cautious, especially when we compare the risk of NSAIDs to opioids in patients with CKD. SWAPNIL HIREMATH: I’m saying that there’s no hard contraindication and I’m never going to say never use it – those are the kind of bold statements that there. I would say that in the GFR 45 to 60, especially, you should not be worried. GFR 30 to 45, little bit more worried, less than 30, you have to be a little bit brave- make sure that the nephrologist is onboard if you’re using NSAIDs because otherwise they’ll to come back and bite you. S: Can we get the hashtag #bitelikeanephro trending on twitter? S: Idk if would catch on – nephrologists are are some of the nicest people in the hospital! A: That’s so true! We had a lot of fun listening to his take on this subject. But he didn’t sugarcoat the risks either. SWAPNIL HIREMATH: But definitely in dialysis patients, it makes a whole lot of sense to use NSAIDs. There’s no kidney! Who care? I’m kidding. But you know, there’s no kidney left to damage. Yes, the hyperkalemia is real. The hypertension that can happen in some patients is real. They can cause AKI; they can cause a decrease in GFR if you have a pre-renal conditions where you’re dependent on the prostaglandin-mediated dilatation of the afferent arterioles. S: Right so in ESRD, if there’s no kidney left to damage, it begs the question of how much do you have to worry about NSAIDs’ effect on further kidney injury or hyperK and hypertension, both which are renal mediated. Per Dr. Hiremath’s expert opinion, not as much. But for the CKD population, did Dr. Hiremath say anything about which NSAIDs are preferable? Are all NSAIDs the same? M: Yeah so his main point was about NSAID potency – the idea being that risk increases with higher potency NSAIDs, which is kind of obvious but I wasn’t aware of which common NSAIDs are low vs high potency. A: It looks like indomethacin is probably more harmful, and options like celecoxib and naproxen probably causes less renal side effects, but he made it clear that we don’t have the head to head studies to confirm this. S: And since we’re talking about risks of NSAIDs in this section, and covered renal patients. what’s the data for other populations, say the ones with GI risks and cardiovascular risks? A: Yeah, so the risks are definitely real, but GI and cardiovascular risk all comes down to degree of exposure. A: A really cool study recently published in JAMA Internal Medicine looked at claims data for a ton of high -risk pati ents with CKD, hypertension, and CHF who were exposed to NSAIDs and with those with same risk factors not on NSAIDS, and there was NO difference in death, cardiovascular disease or renal complications. S: What about our high risk GI patients? M: So there are two overlapping but distinct categories of high risk GI patients – those with bleeds and decompensated cirrhosis. For that first group, the American College of Gastroenterology recommends short term PPI therapy if a patient is moderate to high risk. This is to prevent NSAID-induced upper GI ulcers and bleeds. Our patient is 65 yo and on high dose NSAIDs so she falls in the moderate risk and so PPI is something we could consider. S: Excellent, other high-risk features are previous ulcers and concurrent use of steroids, aspirin, NSAIDs and anticoagulation. We will link the paper in the shownotes though admit that these recommendations are from 2009 but good for you to know in terms of consideration. A: And remember that we’re using these as short-term medications for acute pain- likely 1-2 weeks. S: Right, right so shifting gears, let’s not forget about our friend the liver, any guidance on NSAIDs in patients with cirrhosis? M: So cirrhosis makes using many medications more challenging due to altered drug metabolism, and in general NSAIDs are no different. A: So what I found was that patients with decompensated liver disease are much more dependent on their prostaglandin mediated renal perfusion, so in pts with ascites, using NSAIDs increases the risk for AKI. M: One other thing to keep in mind with this population is the increased risk of bleeding esp in patient with varices. S Alright, so let me summarize the points in this section. NSAIDs are generally safe and probably underused in patients with CKD, especially those with CKD stage III.. That’s not to say they are without risks – monitor for hyperkalemia, hypertension and fluid retention, and perhaps recruit your local friendly nephrologist to help monitor to avoid #nephrobites. Like any other intervention, use the least therapeutically effective dose to reduce risk of other complications like cardiovascular and gastrointestinal disease. S: Ok – so back to our case. Our 65 year old patient with the hip fracture and pneumonia is put on standing acetaminophen, ketorolac around the clock with a PPI chaser, and she is struggling. She can’t participate in PT, her pneumonia is getting better and the care managers are getting antsy that she’s on the verge of overstaying her 3.2-day pneumonia DRG admission. So what now? SHANI HERZIG: Then I think it’s really helpful to talk to patients upfront about the duration of opioid therapy that you anticipate in the event that you are going to use opioids, which should be very sparingly. Talking to a patient upfront about how long you intend to use opioids can really save you a lot of longer conversations later on. M: I feel pretty confident that this is a conversation that I never have, and definitely should be having. S: Right?!? I always want to be a compassionate doctor for my patients and sometimes feel bad about setting up boundaries -it’s just different tone. Dr. Herzig made another great point. SHANI HERZIG: And I think part of being a compassionate doctor is always asking her right patient’s best interest. And that’s the funny conundrum here is that I think often times we do things to make the patient happy because it’s what the patient wants, knowing that it’s not in their best interest. And we should really always try to step back and say, what is in this patient’s best interest, even if they can’t necessarily recognize it. And how can I potentially get them to recognize it. A: Yeah again Dr. Herzig really drills into the importance of bedside communication skills when managing pain in the hospital. I really find this helpful. S: yes, I’ve seen way too many of those M&Ms too. Remember the standing acetaminophen and NSAIDs we started in pearl 1? This is where it becomes really important because it has an opioid sparing effects. A: And, just as important to know is that the combination of non-opioid and opioids creates a synergistic effect. For example, one Cochrane review looked at acute post-op pain treated with either oxycodone alone or in combination with acetaminophen. Oxycodone 10mg+ acetaminophen was more effective at achieving pain reduction outcomes than higher dose Oxycodone 15mg alone. M: that too will be in the show notes. So how do we decide which opioid to use? A: Right, so studies show that as opioid doses and duration of prescriptions increase, the risk for overdose mortality increases. That’s why the CDC guidelines specifically addressed dose and duration. M: So it sounds like adding 2.5 mg of oxycodone q6hr PRN to the acetaminophen would be a good option for our patient. Since we scheduled tylenol we want to avoid Percocet or other combination opioids to reduce the total risk of acetaminophen toxicity. A: Quick tidbit – we chose 2.5mg due to her age of 65. S: Another thing I’ve seen done which is no bueno is using long-acting formulations for acute pain. Stick with the IR. Another amazing JAMA IM study noted that new initiation of long-acting opioids for noncancer pain has been shown to increase mortality by a factor of 2.5 compared IR. Also, it makes sense bc when treating an acute pain episode we want to easily titrate the dose up and down which is easier with IR opioids. A: And one last important point is the route of administration. M: You mean since the patient is in the hospital doesn’t automatically mean we default to IV over oral? A: Yeah, there are a lot of good reasons to choose oral actually. Even though oral meds have a little slower onset we’re only talking about 15-30 minutes compared to IV – and oral has a longer duration of action compared to IV. And we avoid more extreme peaks and troughs, and end up exposing our patients to less opioids overall. M: a.k.a if they have a gut, use it! S: Amazing. So, to summarize this pearl. 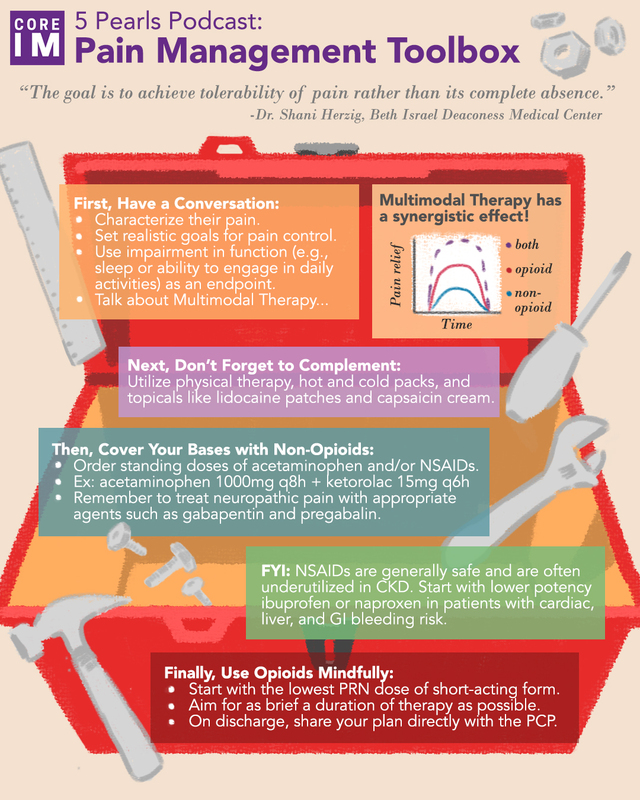 Expectations are again crucially important when starting opioids for inpatient acute pain – before prescribing discuss how long you plan on writing the medication and don’t fall into the trap that you’re not being compassionate clinician by doing so. When choosing specific opioids, adding onto a base of acetaminophen will help reduce the total opioids needed and is actually synergistic and augments pain control. Also, use lowest dose and duration of oral formulations to provide longer coverage compared to the quick-on, quick-off IV formulations. M: Alright case update: With a 2-3 breakthrough doses of 2.5 mg oral oxycodone, our patient was able to participate in physical therapy and is now ready for discharge. S: And it looks like at this point she’ll need short course of oxycodone when she is discharged, what’s the best way go about this? A: One thing we see emphasized with safe opioid prescribing at discharge is that it’s important to make sure there is a conversation with the primary care provider. A: Right, again this is a communication issue. The main things we want to reinforce at discharge is that our expectation is that this acute pain episode will continue to improve and we expect the patient will be able to take less and less medications over time. SHANI HERZIG: But I would wholeheartedly agree with the statement that we should make sure that primary care physicians and other longitudinal providers understand the intent of any prescriptions that we write at the time of hospital discharge as well as how long we anticipate the patient to actually need opioid therapy. A: Exactly, how often are we actually having pain management discussions during a handoff to a primary care provider? S: Yep we know from Dr. Herzig’s work we know hospitalization can increase the risk of chronic opioid use but a few mins in handoff communication can be really helpful for all parties. It can lessen the unease that an inpatient provider might have discharging this patient on opioids and on the flip side, for outpatient provider it gives them a heads up as to what the patient’s condition was and expectations were when they got on opioids on discharge. M: This last pearl is a pithy one – we encourage all of our discharging clinicians – whether they are in the inpatient units, emergency departments or ICUS – to communicate pain management conversations to the primary provider by either email, phone or in the chart msg. Then, if the pain is continues for a longer duration than expected, it’s good to think about further workup for the pain. Pearl 1: We have non-opioid tools we can use to treat pain effectively in the hospital. When measuring response function-related outcomes can give us a better indication of pain control than pain scores alone. Pearl 2: With careful monitoring we can use NSAIDs in many patients with chronic kidney disease in the acute setting. Try to use less potent NSAIDs like naproxen, and maybe involve a nephrologist if you’re using them in more advanced CKD. The same idea of lowest dose apply when using NSAIDs in patients with pts with cardiovascular and liver disease. Pearl 3 Safe opioid prescribing starts with a discussion of treatment goals and duration up front, and then use low dose, oral, short-acting opioids for the shortest duration possible. Also we combine opioids with non-opioid adjuvants like acetaminophen and NSAIDs to create an opioid-sparing and synergistic effect. Pearl 4: We can minimize harm when prescribing opioids on discharge by communicating expectations with the primary care provider. M: So on to the throwback pearl. Today we’re throwing back to an episode by our sister segment mind the gap who covered the mechanism of acetaminophen – what do you guys remember about how tylenol and NSAIDs works? A: There were a lot of nuances but what I remember is that acetaminophen and NSAIDs both likely inhibit COX enzyme from making prostaglandin – and its prostaglandins that cause fevers. S: Exactly, what I thought was cool was understanding where in the body each works which explains why NSAIDS have anti-inflammatory properties but acetaminophen does not. A: Exactly. NSAIDs acts peripherally to block COX and reduce inflammation, whereas acetaminophen acts mostly centrally so it’s not a good anti-inflammatory medication. M: Dr. Tony Breu also released a fantastic tweetorial in conjunction with the Mind The Gap episode a few months ago about acetaminophen, pain control and fever reduction so definitely check that out. S: To loop the idea tylenol and Nsaids and fevers to our episode on pain management – I was once told to NOT put pts on scheduled acetaminophen and NSAIDS bc we can mask fevers so what would you do with our lady with PNA but has pain from a hip fracture? M: Right ‘definitely heard this, if it’s a patient where the diagnosis is uncertain the presence of fever could be useful and you might not want to mask fevers by prescribing acetaminophen and nsaids. but honestly, masking fever is unlikely to be clinically relevant in the majority of cases especially when the source of infection is clear. We also have other markers to monitor infection like white count and heart rate among others. Calcaterra et al. Opioid prescribing at discharge contributes to chronic opioid use. J Gen Intern Med. 2016;31(5): 478-485. Herzig et al. Opioid utilization and opioid-related adverse events in nonsurgical patients in US hospitals. J Hosp Med. 2014 Feb;9(2):73-81. Sriperumbuduri et al. The case for cautious consumption: NSAIDs in chronic kidney disease. Curr Opin Nephrol Hypertens. 2018 Dec 5. Herzig et al. Safe opioid prescribing for acute noncancer pain in hospitalized adults: A systematic review of existing guidelines. J Hosp Med. 2018 Apr; 13(4) 256-262. Grennan et al. Dose response study with ibuprofen in rheumatoid arthritis: Clinical and pharmacokinetic findings. Br J Clin Pharmac 1983, 15, 311-316. Motov et al. Comparison of Ketorolac at three single dose regimens for treating acute pain in the Emergency Department: A randomized control trial. Ann Emerg Med 2016 Aug;70(2):177-184. Chang et al. Effect of a single dose of oral opioid and nonopioid analgesics on acute extremity pain in the emergency department: A randomized clinical trial. JAMA. 2017 Nov 07; 318(17) 1661-1667. Felson, DT. Safety of Nonsteroidal Antiinflammatory Drugs. N Engl J Med 2016 Dec; 375:2595-2596. Bouck et al. Frequency and associations of nonsteroidal anti-inflammatory drug use among patients with a musculoskeletal disorder and hypertension, heart failure, or chronic kidney disease. JAMA Intern Med. 2018;178(11):1516-1525. Klinge et al. The assessment and management of pain in cirrhosis. Curr Hepatol Rep.2018 Mar; 17(1): 42-51. Shah A, Hayes CJ, Martin BC. Characteristics of Initial Prescription Episodes and Likelihood of Long-Term Opioid Use — United States, 2006–2015. MMWR Morb Mortal Wkly Rep 2017;66:265–269. CDC guideline for Prescribing Opioids for Chronic Pain. JAMA 2016 Apr 19;315(15) 1624-1645. Comments? Questions? Feedback? Reach out to us! We'd like to thank Clinical Correlations for giving us our first home and head start! Check them out and subscribe for some great reads! Interested in joining our community? We are always looking for new contributors (educators, writers, editors, artists, social media enthusiasts, or roles we haven't even thought of yet)— if you have a passion for inspiring curiosity and critical thinking, send us a line! Opinions in this podcast are our own and do not represent the opinions of any affiliated institutions. Please don’t use this podcast for medical advice but instead consult with your healthcare provider.